If you’ve been following Little Dog Tips for a while, you may have noticed that I’m a huge fan of using Potty Bells. It’s easily the best training tool you’ll ever buy for your dog. We spend so much time asking our dogs to do things. Sit. Stay. Lay down. But we rarely think about how our dogs will let us know when they want something from us. Once Matilda learned to ring bells to go outside, she had much fewer accidents and didn’t depend on her potty pads as much. She became more confident and more communicative. Guests also get a hoot out of seeing her ring her bells. She’ll smash into them and stare demandingly at whoever is closest to the door. It’s adorable. 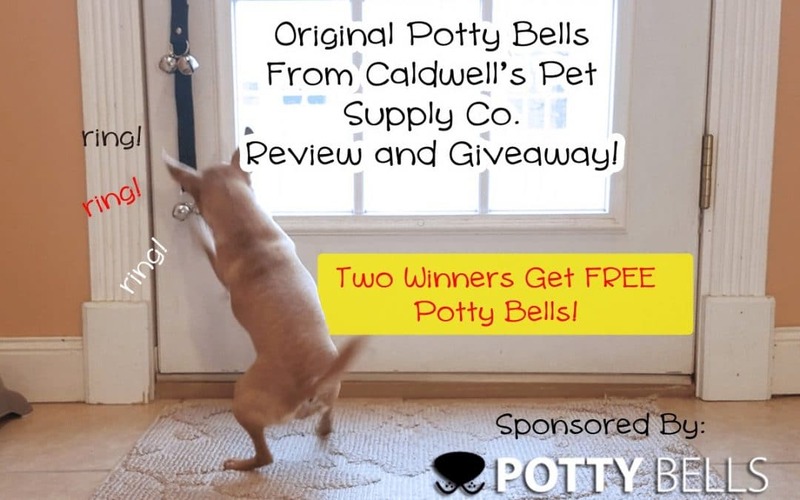 Disclaimer: I received potty bells and compensation in exchange for my review, and this post contains affiliate links. I only feature products that me, Matilda and Cow absolutely love! I wrote about potty bell training in a previous post. It’s super easy, even if you think you’re not the most experienced trainer, or that your dog isn’t very smart or trainable. Communicating via bell deepens your bond and can help set the strong relationship foundation you’ll need for future training. I taught Matilda to ring the bell using treats, then replaced the food reward with the reward of going outside. Cow taught herself to ring the bells by watching Matilda. I’ve tried a few brands of potty bells. I’ve even made a sloppy version of my own with cat toys when I forgot to bring a set to my parents’ house. But Caldwell’s Original Potty Bells are my favorite so far. 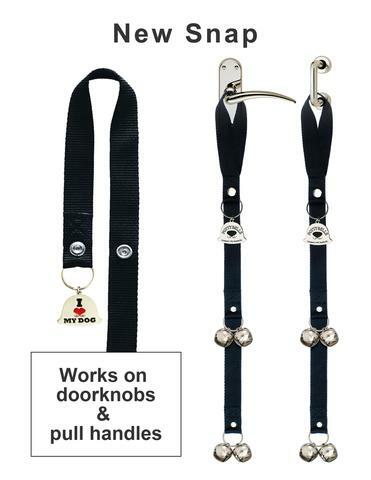 These are the bells that will be hanging from my door forever – as long as there are dogs with doors that need opening, these are the bells I will use! I recommend them for new puppy owners, but it’s never too late to start. 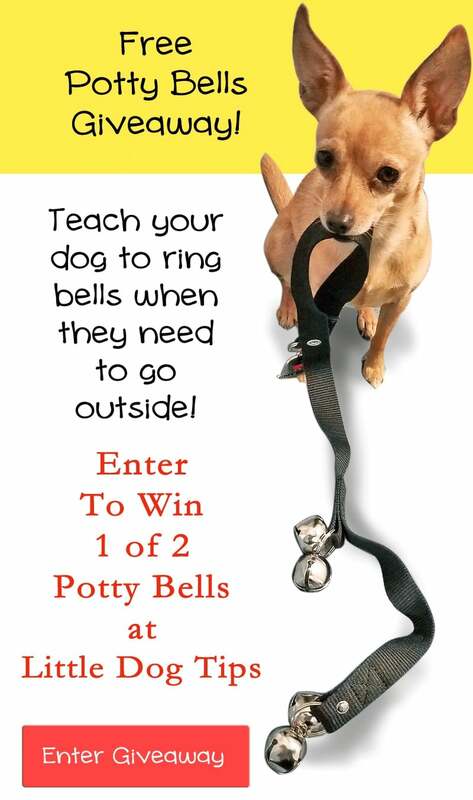 You can use the bells for transitioning from potty pads, or for stopping accidents if you don’t realize your dog needs to go out until it’s too late. Get Yourself Some Potty Bells! I teamed up with Caldwell’s to host a giveaway. Two winners will get their very own Original Potty Bells shipped to their homes. You can also buy potty bells from the PottyBells.com online store! When will your giveaway start?? It says its not started yet. Looks like it would be pretty neat to try out!! i would use them on my 2 younger girls, since the oldest is deaf and never needed anything to help her, she was always good til this past yr. she is elderly. the 2 younger girls need help to let me know if they need to go out. otherwise i have to watch them. they know to go to the door but if i dont see them, they will find somewhere else to go potty. I see! I think it’ll be a big help then, it’s so much easier for them to communicate with a nice loud ring instead of desperately trying to find a spot when they can’t get your attention. I would use this with my Chihuahua, Pookie. She’s so cute, but needs a little help with going potty. I love the name Pookie! Chihuahuas seem to have really short digestive systems to match their size, my friends with bigger dogs were whizzing past me in potty training progress. It really does help that they’re so cute, lol! I know just how you feel! They were a huge help when Matilda was still having accidents. How’s it been going for you? Well, we basically inherited “Lula” from my daughter-in-law who was remodeling her home and didn’t want her anymore because of her “accidents”…We are animal lovers and altho we were not yet over losing our last dog, we took her because we did not want to see her go to a shelter at 8 yrs. old. We are doing our best with trying to give her extra walks, etc. but so far it’s not working…I was thinking about trying to re-crate train her….what do you think? Aw, how sweet of you to take her in. Sometimes it depends on the nature of her accidents. If she’s just not alerting you when she has to go, the bells could help. If she’s not used to being in a crate, it could be stressful for her, but it definitely helps cut down on accidents, especially if they happen when you are not around. A playpen with a potty pad might be a good idea, too, if she might have trouble controlling her bladder. This is a great idea. The hard part is the training. I would use it for my dog since I live in an apartment! I think our two dogs could definitely benefit. Aly (an american eskimo) just typically gets wild when she has to go. She ends up knocking things over and creating a mess. if she had something to let us know before she got to that point it would help. Our pomchi needs to go more frequently than aly, so I don’t always realize when he needs to go. This would help him give us a sign. I thought about it and it’s pretty smart. My rescue is this timid little thing that never makes sound. She’s really smart but tells me she needs out by staring at me and me figuring out what she wants. This could be a game changer for us. I’m sure she’d love these, Matilda really got more confident once she learned how to communicate with the bells. It changed her personality a lot! I have two as well, I only had to teach one – the other learned by watching. It’s a ton of fun! I love the idea! I have two miniature schnauzers and they’re very smart so they would catch on to this really quickly! First, my dog Mochi looks exactly like the dog in the photos above 🙂 She would use them if I attached them to the back door that leads to the backyard. I think these are great ideas. Honestly, I love the idea. Our yellow lab used to use it when we first got her, instead of barking or whining, she rang the bell and we’d come running. After a while though, she stopped using it. I think it is a great training method for any future dogs we get! I would use them on our Zeus. He is such a sweet and gentle soul but was so badly abused before we adopted him that he is still hesitant about barking. This would really help us to know when he needs to go.